Imagine a flimsy Japanese Enter the Dragon knock off with a female lead and support from a cartoon gang of B movie villains straight out of a kung fu re-imagining of a Roger Corman movie and you’ve basically got this. 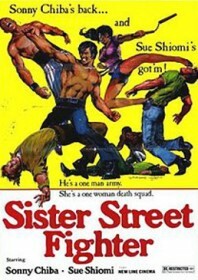 A competent Etsuko ‘Sue’ Shihomi raids Bruce Lee’s wardrobe to play a karate fighter sent on a dangerous rescue mission to locate her kidnapped brother, who is being stuffed with drugs and kept locked in the underground lair of a narcotics nutcase. He’s putting heroin into wigs, and somehow this inane endeavor attracts a rabble of completely barking underlings, including the Amazon 7, a gang of Thai fighters in Fred Flintstone costumes, and a group of shifty pugilists who appear to be wearing wicker bins over their heads. Then there’s the kingpin himself, who wears a cloak, big collar suits and a Han-like claw to rip into Sue after her relentless attempts to break into his compound and speed up the story. Remarkably, both Shihomi and backseat co-star Sonny Chiba (who crops up again near the end to take all the credit) still manage to come out of this looking respectable, what with this essentially being a platform to launch Chiba’s prize female student into the spotlight and trading graciously on the name of the actor’s most famous franchise. It hasn’t got the slightest thing in common with The Street Fighter, but you’ll still enjoy this, even though you probably shouldn’t.